In this thoughtful study, respected Old Testament scholar Patricia K. Tull explores the Scriptures for guidance on today's ecological crisis. Tull looks to the Bible for what it can tell us about our relationships, not just to the earth itself, but also to plant and animal life, to each other, to descendants who will inherit the planet from us, and to our Creator. She offers candid discussions on many current ecological problems that humans contribute to, such as the overuse of energy resources like gas and electricity, consumerism, food production systems—including land use and factory farming—and toxic waste. Each chapter concludes with discussion questions and a practical exercise, making it ideal for both group and individual study. This important book provides a biblical basis for thinking about our world differently and prompts us to consider changing our own actions. Visit inhabit ingeden.org for links to additional resources and information. "The Bible speaks in many ways about God's commitment to Creation, and our calling to be good stewards. Trisha Tull lifts up these Biblical voices with passion, humor, and real sensitivity, and helps us hear God's word in a new way." "In this fine work, the reader will encounter many helpful stories, questions, and suggestions from which to draw inspiration and encouragement. I believe that anyone interacting with this resource, whether Christians long dedicated to ecological justice or those just beginning to ask about the connections between faith and the environment, will go away with new ideas, rejuvenated spirit, and a willingness to try something new." "Here's a book that is right on target. Patricia Tull finds that rare balance between Bible study, personal reflection, ethical insight, and social commentary that will move readers to action. For those who think that the church should stay out of the `politics' of climate change and creation care, this book is the perfect gift." "We have all strayed far from the Garden, resulting in a world where there are no elms on Elm Street and no chestnuts on Chestnut Lane. But God is doing a new thing, stirring the call to care for creation in the hearts of people. 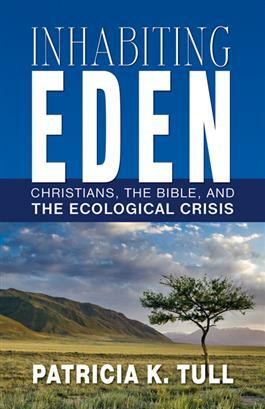 Books like Inhabiting Eden give voice to this important movement, urging readers to live the life our creator God intended from the beginning. Highly recommended!" "With a gentle touch and inviting prose, Patricia Tull shares Scripture's timely message for modern ecological challenges. Her words ring with hope that we may indeed recover Eden: a new and beautiful way of belonging rightly within the marvel of God's Creation."